April 3, 2014; The main star of" Dyesebel" -the fantasy series of ABS-CBN , Anne Curtis, was rushed to hospital in San Juan and Lipa in Batangas due to stung of box jellyfish while taping the teleseries. Anne were covered with red rashes in large part of her body after jellyfish sting. An exclusive photo of Anne Curtis affected body of red rushes due to box jellyfish sting where publish on ABS-CBN news. Box jellyfish is also known as "sea wasps" and "marine stingers", these are cnidarian invertebrates distinguished by their cube-shaped medusae and their stings are extremely painful and sometimes fatal to humans. According to National Geographic, the box jellyfish's venom is among the most deadly in the world that contains toxins that attack the nervous system, heart, and skin cells. 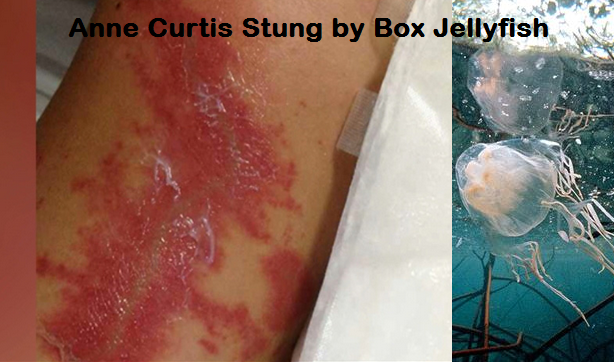 On this case, Anne Curtis was so lucky that her life were not in danger after being stung by box jellyfish as she also mentioned after reading info about this type of jellyfish. Anne gives advise that everyone must be careful when swimming in the ocean specially this summer to avoid the same incident. Netizens are waiting for this update about what happened to Anne Curtis when the news first came out online. Lets hope she will recover soon and continue the taping of most viewed telesere of early year 2014 "Dyesebel" according to the survey. Speak up your mind, post comment below, thanks.